It’s time to look at the sales distribution charts for July. (See bottom for standard disclaimers and explanation of method). As is our custom, we’ll start with DC. With July, we’re really starting to see the fruits of DC’s relaunch program… and the massive orders for Batman’s non-Wedding. Batman #50 gets ~440.8K orders. Doomsday Clock manages to ship and gets ~135.1K. Superman #1 gets ~133.7K. Catwoman #1, trading on the non-wedding, debuts at ~121K. Batman #51 is ~111.5K. 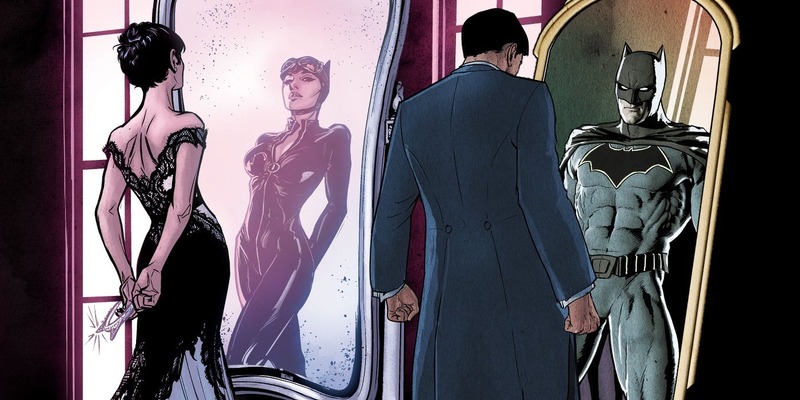 Now, of that unusually robust group, you’ve got Doomsday Clock, Batman #50 and Catwoman off in the Event category. And wow, did Catwoman #2 show up a lot lower on this week’s Comixology Best Sellers list for digital. And then Superman probably has some standard attrition on the way after the debut, but that’s still a really healthy top of the list. 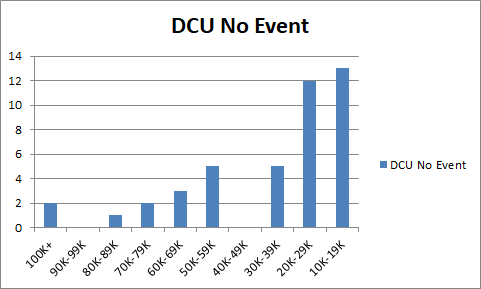 The Event changes are in the top bracket, but even the no event chart looks healthier. The relaunched Justice League placed issues at ~80.7K and ~77K this month. We’ll see where it lands next month but there’s a reasonable chance it settles in above 70K and that a big win based on recent sales. It’s too soon to guess at where the Superman franchise sales are going to settle, but Action #1001 relaunches at ~79.3K, so like Superman, it’s up for the moment. Teen Titans jumps up to just under 68K out of nowhere. There’s a new direction, but it could also be speculators chasing Lobo’s daughter, so we’ll have to see if the sales stick around on this one. Justice League Dark debuts at 60.3K. That’s a first issue, but it’s a really strong debut for a Justice League B-title, based on recent sales. Wonder Woman #51 spikes to ~50.9K. Then there’s something strange. While DC has a lot more issues selling 50K+ in July, it has nothing in the 40K-49K sales band. The list goes from Wonder Woman #51 at ~50.9 to Wonder Woman #50 at ~38.4. A large and unexpected gap. 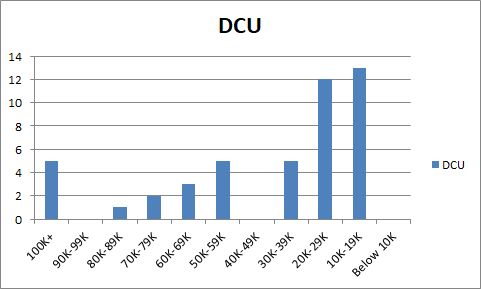 Also unexpected, at least in recent months, there are no DCU titles selling under 10K in July. Is it a problem that the bracket with the most issues in it is 10K-19K? Definitely, and you can probably chalk that one up to the “New Age of DC Heroes” line having six issues selling under 20K. Of that group, only The Terrifics crosses the 20K barrier with ~24.7K orders in July. DC is still bottom heavy, but there’s a top list again… at least for July. Is DC out of the woods yet? Not necessarily. We need to see where the Justice League and Superman franchises settle down to and that will take a couple more months. I’ve been hearing universally good things about Justice League from retailers, but some differing opinions on Superman line performance. Batman was losing momentum and fell under 100K before the wedding hype picked up, so we need to see if that stays hot or cools off. You’d like to think Morrison and Sharp on Green Lantern is going to sell over 60K, though. For the moment things are looking up. For the rest of the line, it’s a quiet month. Wild Storm is what it is. Vertigo’s return to the Sandman franchise only launched last week, though the early buzz seems to be one of favorable sales. The Hanna-Barbera line awaits a fresh wave. Standard disclaimers: The numbers are based on the Diamond sales charts as estimated by the very reliable John Jackson Miller. These charts are pretty accurate for U.S. Direct Market sales with the following caveats: 1) you can add ~10% for UK sales, which are not reflected in these charts; 2) everyone’s best guess is you can add ~10% for digital sales – while some titles do sell significantly better in digital (*cough* Saga *cough*), that’s the average rule of thumb; 3) it’s not going to include reorders from subsequent months, although reorders will show up in subsequent months if they’re high enough. So if you’re a monster seller in Southampton and it took the US audience 3 weeks to reorder, it’s probably not going to be reflected here. What’s a sales band? It’s another way to have a higher level view of the market. The general idea is to divide the market into bands of 10K copies sold and see how many issues are in each band. How many issues sold between 90-99K copies, 80-89K copies, etc. etc. 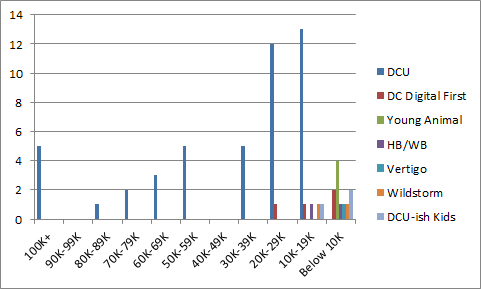 In very broad terms, the market is healthier when there are several titles selling in the 70K-100K+ range because titles that move a lot of copies give the retailers some margin of error on their ordering. When you see titles selling in the 20-29K band and especially below, there’s a pretty good chance a lot of retailers aren’t ordering those titles for the shelf (pull box/pre-order only) or minimal shelf copies at best. I’d love you to take a deep dive analysis, Todd, of DC’s New Age of Heroes titles “related” launches, like the new Hawkman series.